Allow extra time to locate the campus and to park. If you are running late, please contact us at (800) 249-6412 or (218) 723-6046. A visit to CSS will involve a walking tour of our campus, so wear comfortable walking shoes. Some of the tour will be outdoors, so be sure to dress in layers. We also suggest bringing a camera. We are happy to make arrangements for any additional needs, such as an interpreter or a meeting with The Center for Equal Access. Please let us know of any special accommodations one week in advance of your visit. 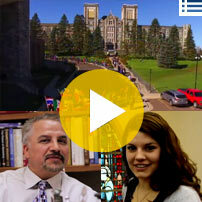 We're glad you're thinking about visiting The College of St. Scholastica. There's no better way to make your decision on where to attend college than to visit. Get a feel for life here in Duluth by taking a tour of our beautiful campus and meeting with faculty and students. The College of St. Scholastica invites you to experience our community and discover what being a Saint is all about! We recognize students are at many different phases in the college search process, so we offer a variety of visit options. Please note: Individual visits are not listed for MEA weekend. You're invited to attend our Open Houses on October 18 & 19. If you have any questions email us at visitcss@css.edu. To arrange a visit, complete our online registration form. If you have any questions, please call our Admissions Office at (218) 723-6046 or (800) 249-6412 or email us at visitcss@css.edu. If you are a high school counselor, college readiness coach, or teacher who would like to arrange a group visit (AVID, TRiO, school groups, etc.) to St. Scholastica, please fill out the visit request form. Please note that: We are available for group visits Tuesdays and Thursdays at 10:00 AM & 12:00 PM. No exceptions will be made. Group visits take approximately 2 hours and consist of a campus tour and an admissions presentation. Please take this into consideration when scheduling your visit. Please plan your visit at least two weeks ahead of your preferred date. We prefer that groups be at or under 50 people, and juniors and seniors in high school. We require one chaperone per 10 students. If you are running late, we reserve the right to alter your schedule as we see fit. *Please note that we do not have the funds to cover meals or housing. To arrange a group visit, please complete this online visit request form and an admissions representative will contact you directly. 2019 open house dates coming soon. If you have any questions, please call our Admissions Office at (218) 723-6046 or (800) 249-6412 or email us at visitcss@css.edu. Start exploring! Find out what the Minnesota private colleges and universities have to offer. Sessions will be held twice daily on 17 campuses statewide (including The College of St. Scholastica)! Discover Duluth is a FREE overnight summer program to give Twin Cities-area high school students in various college readiness programs a chance to experience The College of St. Scholastica and the city of Duluth in a unique way! If you have questions, contact Kiara Gomez or Lee Parker. Comfort Inn West, 3900 W. Superior St., Duluth, (218) 628-1464 - Book here online or ask for the St. Scholastica visit rate when you call to book your room (discount is 15% off the retail rate). Country Inn & Suites - Duluth North, 4257 Haines Rd., Duluth, (218) 740-4500 - Mention your CSS tour when you call to book your room. Hampton Inn & Suites - Duluth North Mall Area, 1002 Mall Drive, Duluth, (218) 481-7707 - Book online here or ask for the St. Scholastica visit rate when you call to book your room (discount is 8% off the retail rate). Holiday Inn® & Suites - Duluth Downtown, 200 W. 1st St., Duluth, (800) 315-2621 - Mention your CSS tour when you call to book your room. Holiday Inn Express & Suites - Duluth North, 4725 Market St, Hermantown, (218) 722-0909 - Ask for the CSS rate when you call to book your room. La Quinta Inn & Suites, 1805 Maple Grove Rd, Duluth, (218) 722-0700 - Ask for the CSS rate when you call to book your room. Duluth hosts several events throughout the year. Check out out all the latest information on upcoming events. From great burgers, to locally smoked fish, to massive burritos, there's amazing food everywhere you turn in Duluth. Here's a list with all the options.